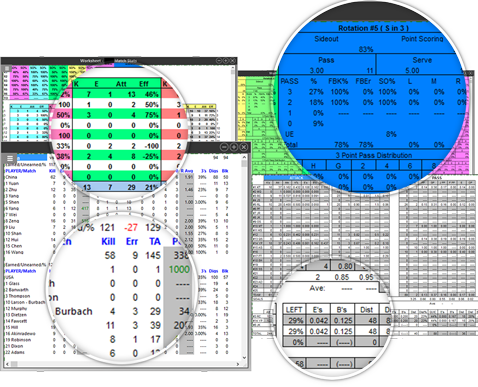 The statistics and analysis software used by the best teams worldwide. LITE version available now! that you can customize based on your need and ability: you can focus on few key data, or you can scout all the skills, to analyze every possible perspective of the game. 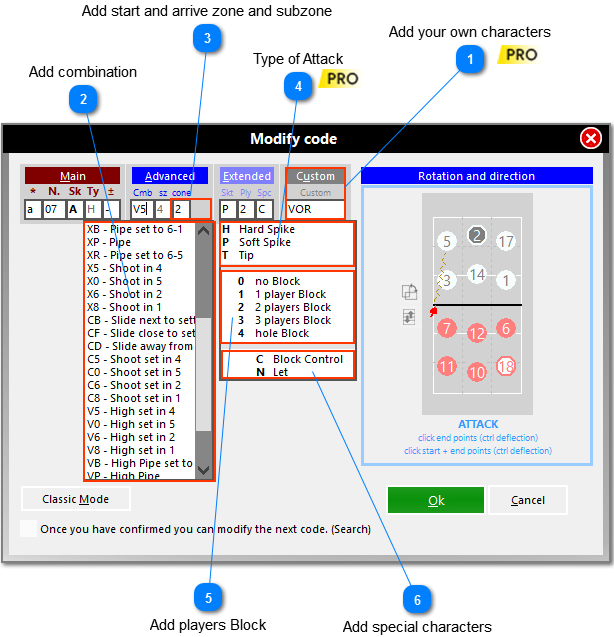 thanks to the automatic codes entry of the skills related to each other (serve/reception and attack/block), which allows you to enter more information, typing fewer characters. to complete your data study. 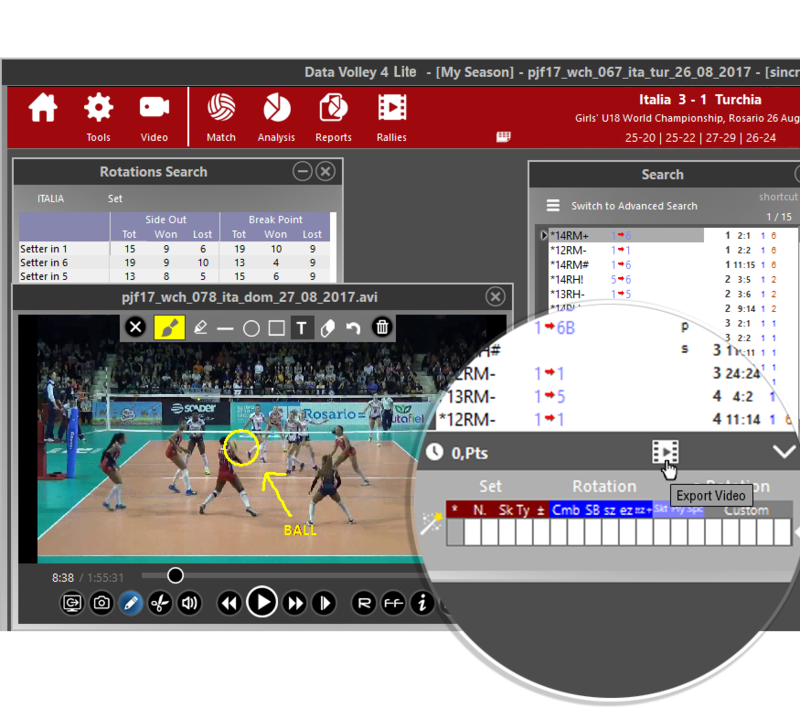 In the new Data Volley you find two software in one: in addition to the scout, you also have the video analysis, in order not to miss a single detail of the game and to link to the statistics a visual feedback. through the client, accessible from any device. Watch the video streaming and the replay of last 5 points. Save and watch later the most important clips. Share useful info for the game strategy with coaches, statistics with press and TV. where the collected data may be used to study athletes' efficiency and their evolution over time, in order to prepare exercises aimed at improving performance. as needed. The data processing possibilities are endless and it’s possible to differentiate the analysis by recipient, inserting in the study only the required items. The icon indicates Professional version only features. 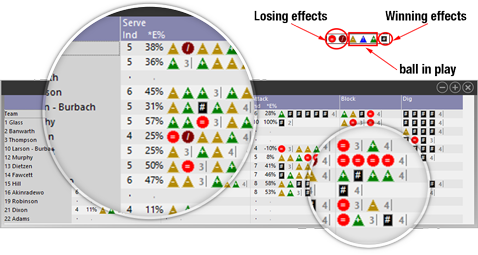 Find out Data Volley 4 Professional main features compared to Data Volley 4 LITE. 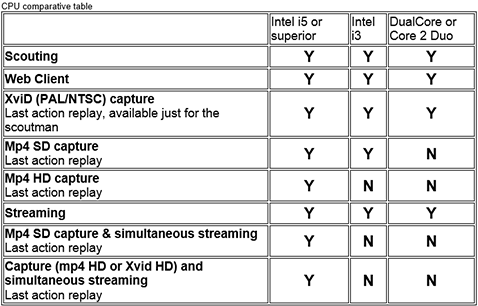 If you want to learn more, download the complete comparison chart. Scout all the skills while focusing on each detail of the game. Scout in real time during the match and then complete your work afterwards. Utilize the program according to your needs and abilities. You can choose to focus only on a few skills or create a completely detailed scout for the most accurate and detailed analysis of all of the data. Watch the rally and type the codes on the keyboard. 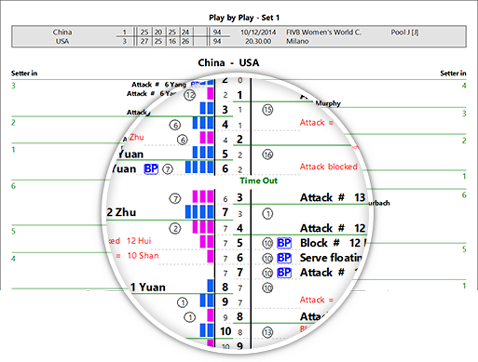 Data Volley allows you to keep track of both teams and every contact in real time during a point. Synchronize the scout to the video of the match, to get an even more complete and detailed analyisis and search the rallies of interest. You are able to edit your scouted data from a match anytime you want; by double-clicking on a code in the code list, the program allows you to modify your code. 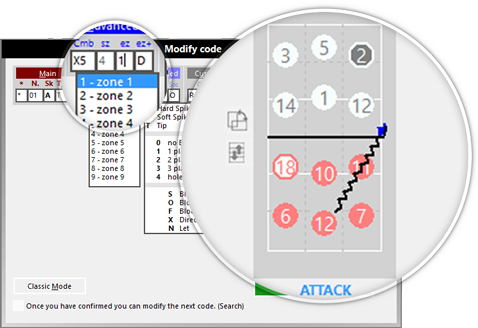 It opens a window, which will allow you to make corrections and add advanced information such as the zones, setter calls, attack combinations, etc. Adapt your strategy in real time according to the information from your scoutman. 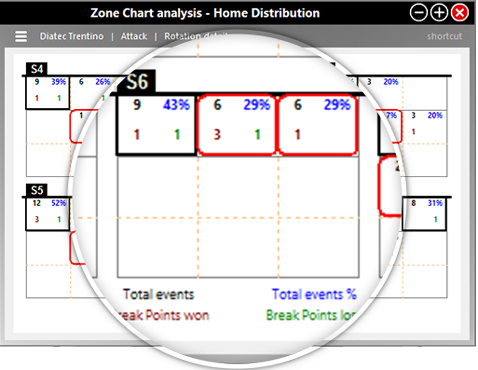 Each piece of statistical data may help you to change the outcome of the match. Even when scouting only the basic codes you are able to record the information needed to access detailed analysis of those skills organized by player and rotation. Evaluate the scouted skills according to the zone where they are performed; allowing you to understand where you can have the best results. In the version you can add advanced filters, according to your specific needs. How are your athletes playing? You can see the results of the most recent contacts, organized by player and skill. Allowing you to track each player’s performance trends for each skill. Set your personalized analysis criteria. You can select and analyze each skill at your convenience. You can immediately see the distribution of the setter related to the attacker or by the zone where the attack is performed. In the version you can add customized filters in order to have even more specific analyses (e.g. !, + and # receptions). Analyze the historical distribution and efficiency of attacks according to the zone where they are performed differentiated by rotation, reception quality, etc. Default worksheets available in the LITE version. In the version you can also create personalized analyses with customized complex formulas using a simple wizard editor. This allows you to organize and analyze the scouted data in the way that best meets your specific needs. 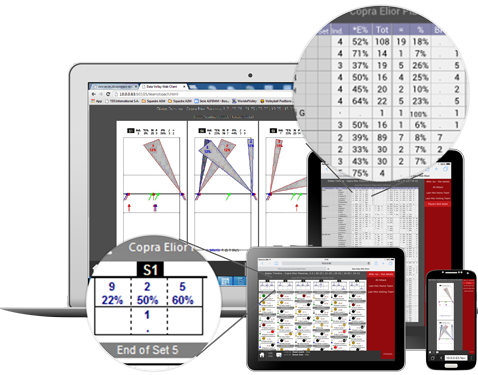 Analyze afterwards the scoring trends of a set or the entire match. Focus the eye at the center of the page on the graphic that displays the scoring flow and the visual representation of the scoring gap between the teams. Using different colors allows you to easily follow the scoring runs during each set. 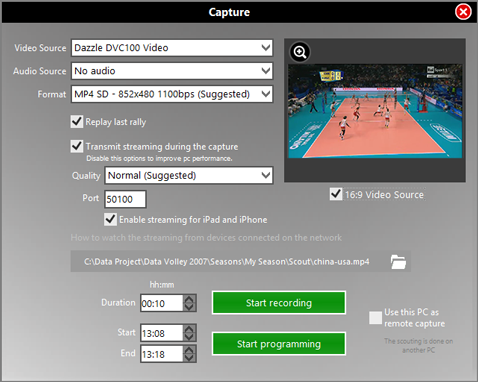 All of our expertise and experience in one software; Data Volley 4 has fully integrated all the features of Data Video. 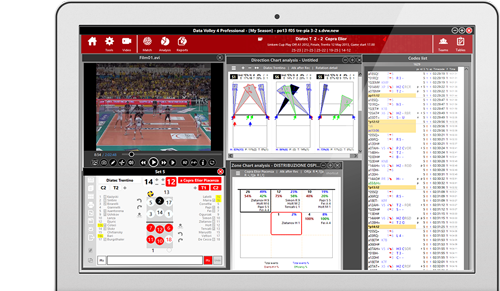 You no longer need to have separate programs for scouting and data analysis and another that synchronizes video. For Data Volley 4, the best comes together... to be even better! At the end of the match, you can import and synchronize the video to the scout just detected, to get an even more complete analysis. If the video is not in the format requested for your championship, you can use the Convert feature to transform it into the desired format. The software captures video using a video camera connected to the computer and automatically sends the stream or the last four actions to the desired client... All in real time! Video Exportation: select one research (rotation search, statistics search, free search) of one match, customize it with texts and draws and export the video. Video Montage: select two or more researches of one or more matches, modify or add further analysis of interest, customize them with texts and draws and save the montage. Data Volley 4 Professional offers many additional features for the staff during and after the match. The Web Client App allows to communicate with the bench and media, the Client to get more accurate analysis. 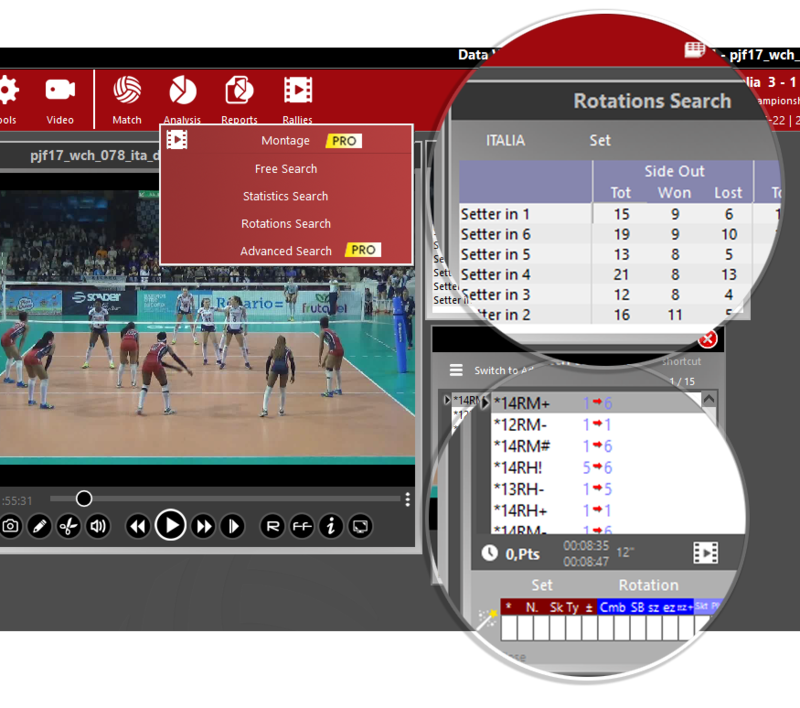 The Reader allows to use Data Volley 4 features even without the Key, while with the Player App you can watch again different game situation. 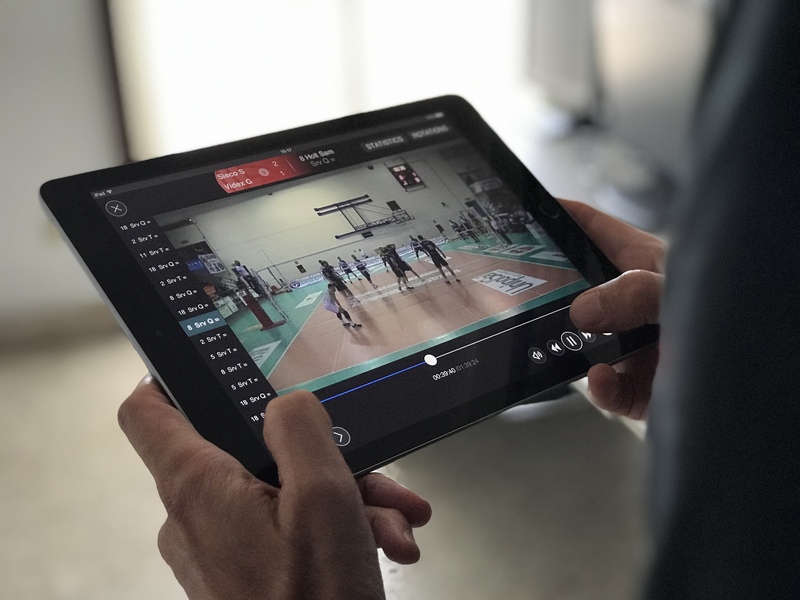 With the Web Client App you can create a local network, allowing to share the collected data in real-time, to capture the video and then stream it to the bench. You can also watch the last four actions, share messages on chat with the bench, share timeouts, substitutions, and rotations during the entire match. You can decide what to share with the head coach, the assistant coaches, the media or the commentator. 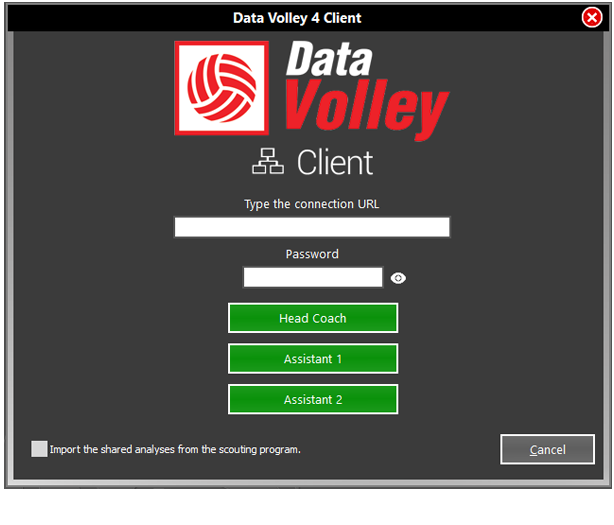 Compared to the Web Client, Data Volley Client displays analysis already stored in Data Volley as well as it allows to create new analysis with no restriction. This feature is for skilled users, to deeply analyse the game, allowing them to search any statistical output and create custom analysis. 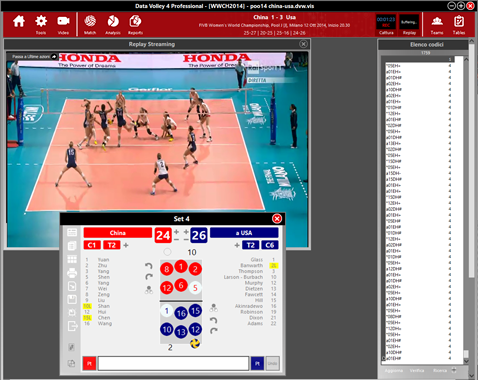 Beside the analysis, Data Volley Client allows to play live video streaming and to manage the chat. 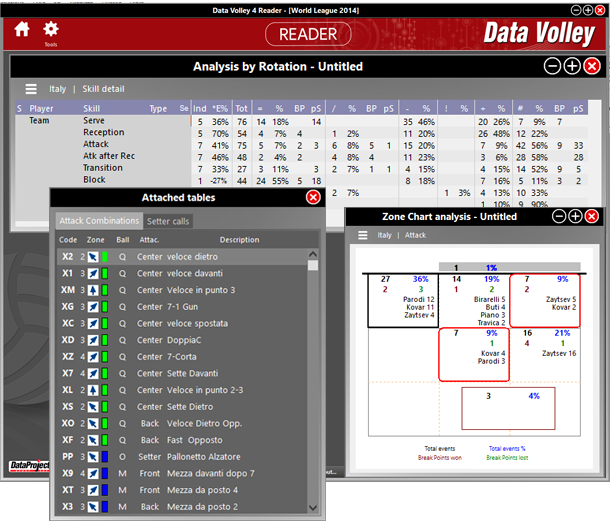 The Reader allows to use Data Volley 4 on up to 4 devices at the same time by using just one licensed key on the main device. The Reader is a basic tool for all coaches who need to have a personal analysis after a match, or want to start to analyze the next opponent team: in fact, it has been developed to meet all the needs of the Staff. 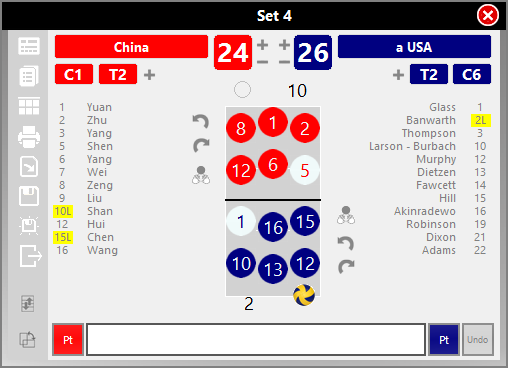 Available for Android, iOS, Windows and Mac OS, it allows to import a match or a synthesis from Data Volley 4 and analyse it in a few clicks. Perfect for players and staff who want to examine and watch again different game situation. It is now possible for some selected apps to connect and communicate with Data Volley 4 Professional, enabling users to have access to different levels of information and analysis. 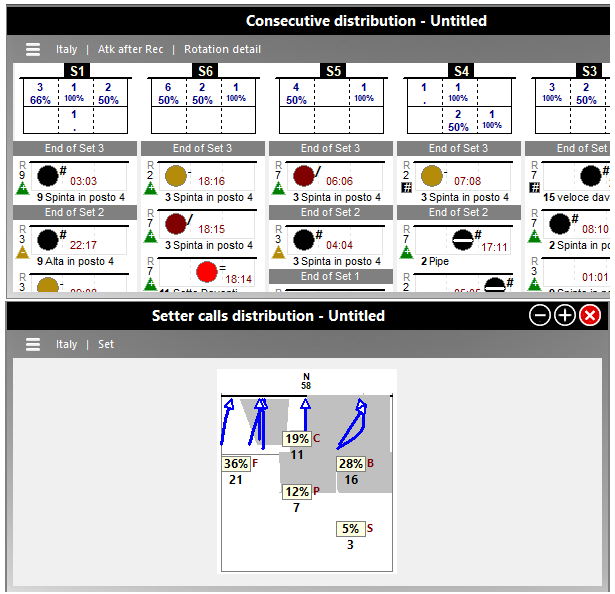 The first application connecting to Data Volley is SeTTEX (Second Touch Tactical Exploration) in its Premium version, the revolutionary app developed by Moxoff (spin-off of Politecnico di Milano) that, thanks to its advanced mathematical core, tracks the setter and assists the coach in real-time by suggesting the best tactics for the game. 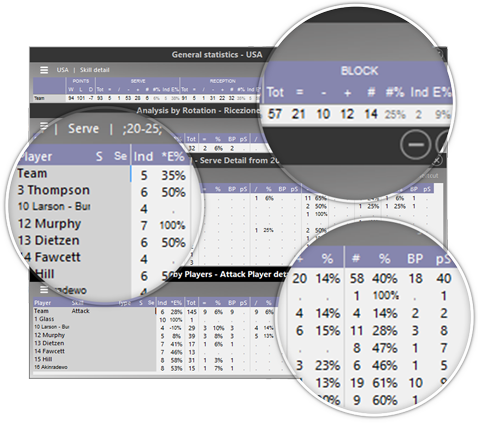 Data Volley allows SeTTEX to have real time access to the data collected by the scoutman (without any interference with data gathering) in order to provide the user with an automatic, realistic and immediate picture of what is happening on the court with no need to keep track on screen of where the ball is touched. 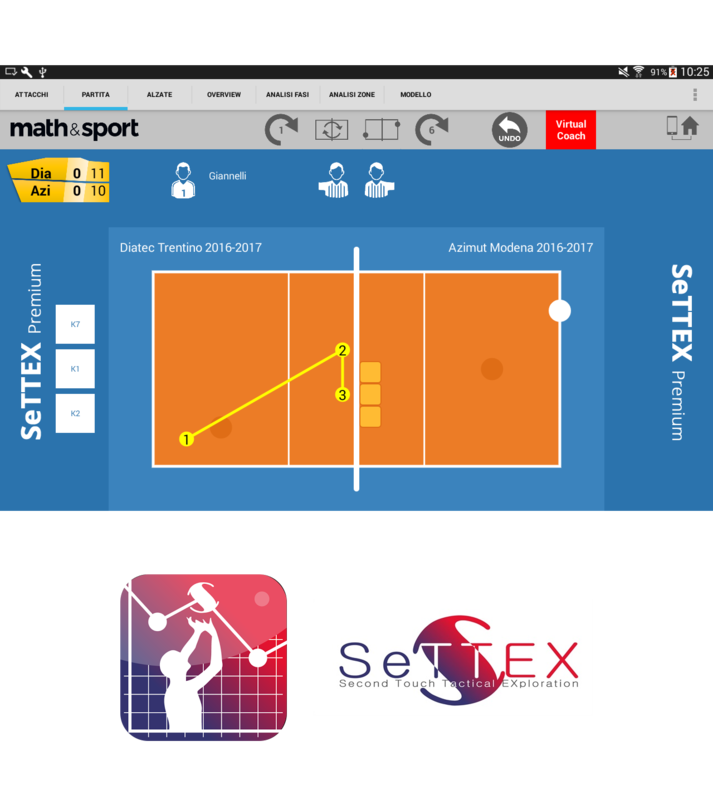 Moreover, its innovative Virtual Coach function, the key feature of SeTTex, monitors the opponent setter and highlights the behaviors that can be exploited to gain advantage on the opponent team. Data Volley 4 works only on Windows operating system (Windows 10, Windows 8, Windows 7, VISTA, XP SP3). To operate without slowdowns Data Volley 4 needs a computer with a Core i5 processor, at least 2GB of RAM, a USB port for inserting the dongle and Internet connecttion for license activation and automatic downloading of updates. Data Volley 4 is available in Italian, English, Spanish (Castilian and Latin American), Japanese, Russian, German, French, Polish, Dutch, Portuguese, Chinese.